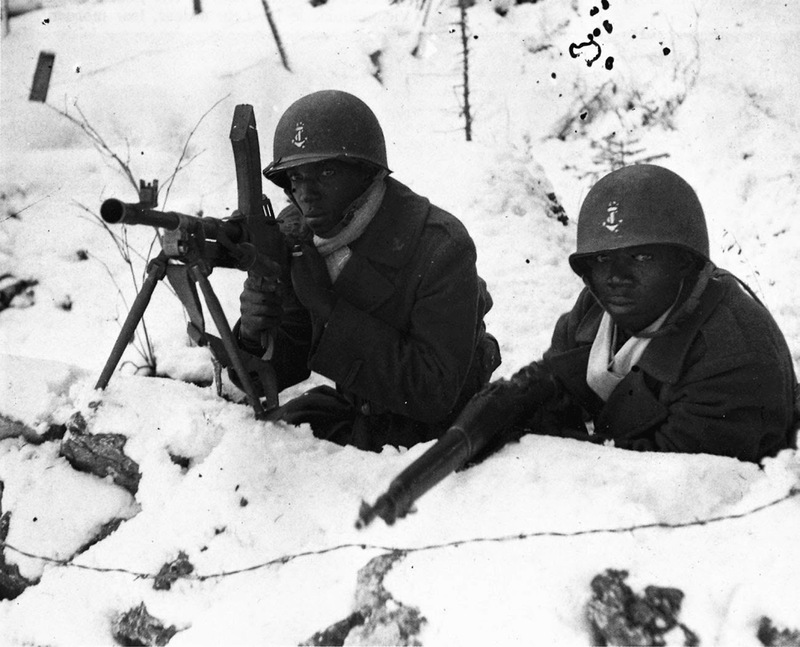 Soldiers from the French African colonies holding a position at Boucle du Doubs, near Besancon, France, winter of 1944. Soldiers from the French African colonies holding a position at Boucle du Doubs, near Besancon, France, winter of 1944. These soldiers are part of Senegalese Free French troops. They are armed with a British Bren and an American 1903 Springfield. The helmets are American ones, emblazoned with the anchor emblem of the French Colonial forces. The Free French used a wide array of Allied equipment. France at the time of World War II had many colonies in Africa. Before the War, France recruited Africans both to serve in African colonia connstabularies and the French Army. Unlike the situation in France itself, the colonial soldiers were all volunteers. During World War II these African troops played an important role. The Tirailleurs Senegalais troops were used in even greater numbers, initially by Vichy France and later by the Free French. In 1940, African troops comprised roughly 9% of the French army. The French recruited more than 200,000 black Africans during the war. Approximately 25,000 were killed in battle. Many were also interned in German labor camps and thousands of black prisoners of war were murdered by the Wehrmacht. After the Liberation of France, the African troops were removed from service in Europe and replaced with white soldiers on the order of Charles de Gaulle, a process known as blanchiment (whitening). Being black during World War II had some small advantages. German infiltrators were disrupting the Americans defense by wearing American uniforms. This lead to paranoia and a lot of ID checks. The black units however did not have this problem since the Germans had no black soldiers. They could carry out their work without having their identity being doubted. General de Gaulle ordained formation of the first Free French division in Palestine just in time to take part in Operation Exporter, the Allied invasion of the Vichy-controlled French Levant. This campaign is often referred to as a tragedy of Frenchman against Frenchman. More exactly, the majority of Free French battalions in the operation were composed of Senegalese troops who were reluctant to kill their Senegalese countrymen serving with the Vichy defenders; as a consequence, the Free French brigades earned a poor reputation with the British. This photograph makes an important point and reiterates a truth that some revisionists of National Socialism want to deny, i.e., that "the Germans had no black soldiers." So much for the myth of the great multicultural Heer, Wehrmacht and/or Waffen SS. you re an Idiot there ar eplenty pictures out there of Blck wehrmacht soldier...not as many because tehy didnt havetehslave culture Jew.S.A had. You gullible bafoon giving so much credit to some words next to a picture... Voting Hillarious to I assume. Euh, yes but this photograpy is also (and above all) a picture about the ancient french's colony system. The black soldiers were enlisted against their own will. Read the text, Ginger. Soldiers from the French overseas departments were volunteers. Link to proof if you believe otherwise. Ginger is right. My grand father was one of those soldiers enlisted by the french; they pretend and wrote in the history books that the Africans volunteered; they mean they volunteered our men. What's truly sad is that those people from colonies were barely rewarded after the war. Were we in other European armies besides the British and French armies.